4558 11 18 Kr. Ochre-brown, small breast shield, wonderful fresh colors, excellent embossed and in perfect condition mint never hinged an especially nice copy this breast shields rarity. Outstanding quality! Photo expertize \"perfect quality\" Krug BPP. 4559 11 18 Kr. Ochre-brown, small breast shield, fresh colors, good embossed and well perforated with complete original gumming and minimum hinge trace. An outstanding quality this sought-after and rarely issue! Photo expertize \"perfect quality\" Krug BPP. 4560 ∆ 12 10 Gr. 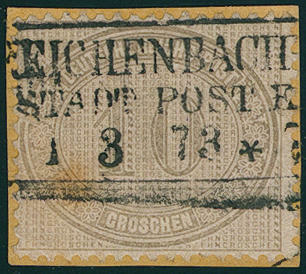 Brown gray fresh colors and well perforated, small scratch in the margin and small yellowish spot, as far as in perfect condition on piece with rare exclusively town cancel cancellation from \"REICHENBACH city post EXPED. 1.3.73. \". An impressive copy of this rare and sought-after issue! Photo expertize Krug BPP. Michel 1800,- €. 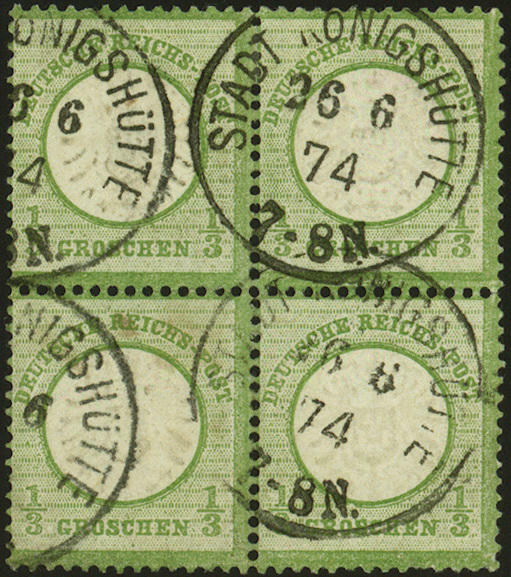 4561 Dez 13 Stamps for internal usage 1872, fresh colors and in perfect condition unused with original gumming. Michel 215,- €. 4562 ∆ 14 1 / 2 Gr. 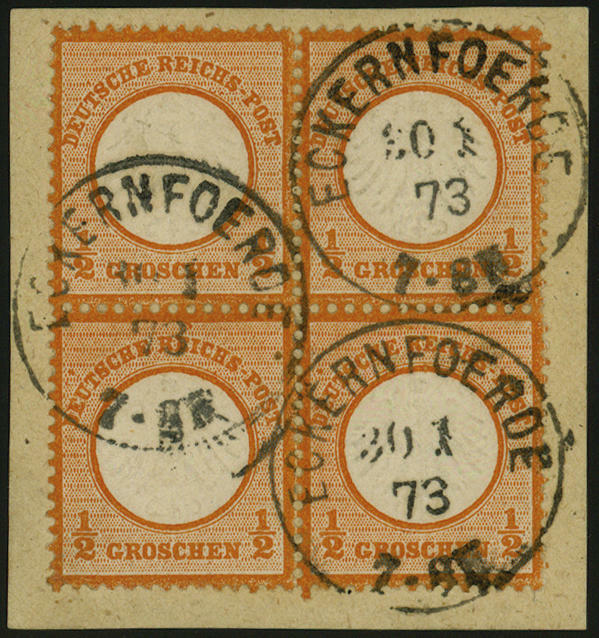 Orange, small breast shield, wonderful block of four, wonderful fresh colors, very well centered and perforated, in the best way embossed on piece with clear single circle postmark \"ECKERNFOERDE 30.1.73\", A dreamlike beautiful copy of this rare unit, photo expertize Sommer BPP. 4563 ∆ 15 2 Kr. 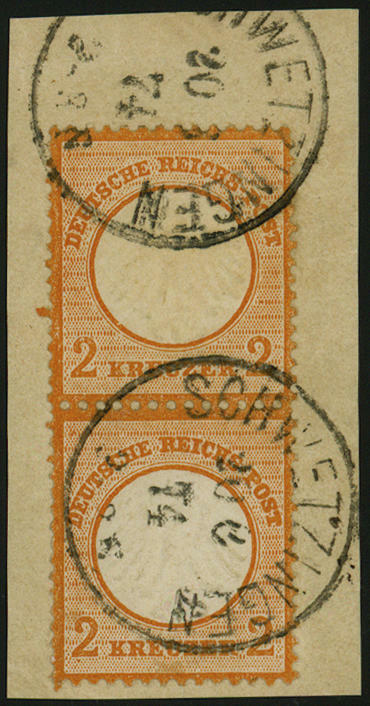 Orange, small breast shield, vertical pair, wonderful fresh colors, excellent embossed, in perfect condition centered and perforated on beautiful letter piece with clear single circle postmark \"SCHWETZINGEN 20.8.74\", outstanding quality of this rare unit, photo expertize Hennies BPP. Michel 900,- €. 4564 ⊙ 17a 1 / 3 Gr. Green, large shield, block of four wonderful fresh colors, small faults, neat cancelled \"city KÖNIGSHÜTTE 26.6.74. \", an attractive and scarce unit, expertise Hennies BPP. Michel 1400,- €. 4565 17b 1 / 3 Gr. 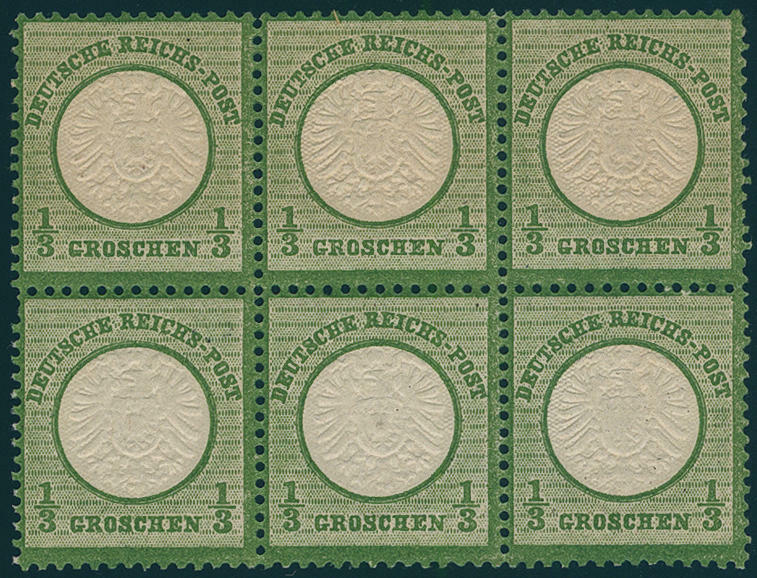 Dark green, large shield, horizontal block of six, wonderful fresh colors and deep colored, well perforated and embossed, in perfect condition mint never hinged an especially decorative and very scarce unit! Photo expertize Hennies BPP. 4566 ✉ 17b 1 / 3 Gr. 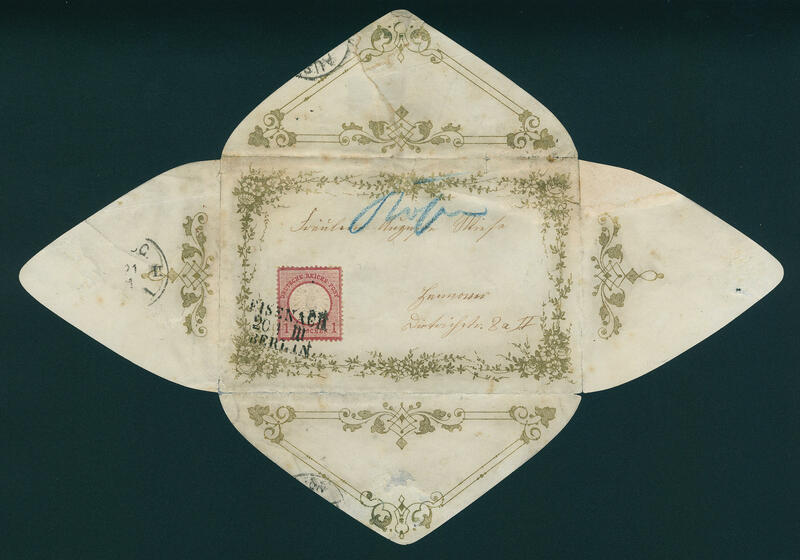 Emerald green, the scarce colour, wonderful fresh colors in the vertical strip of three on very decorative, faultless cover with two clearly single circle postmark \"old JANNOWIETZ 10.12.74. 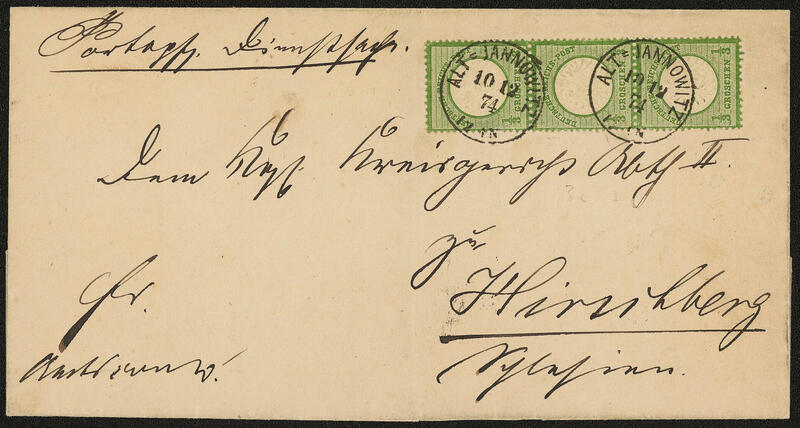 \" to Hirschberg / Silesia. 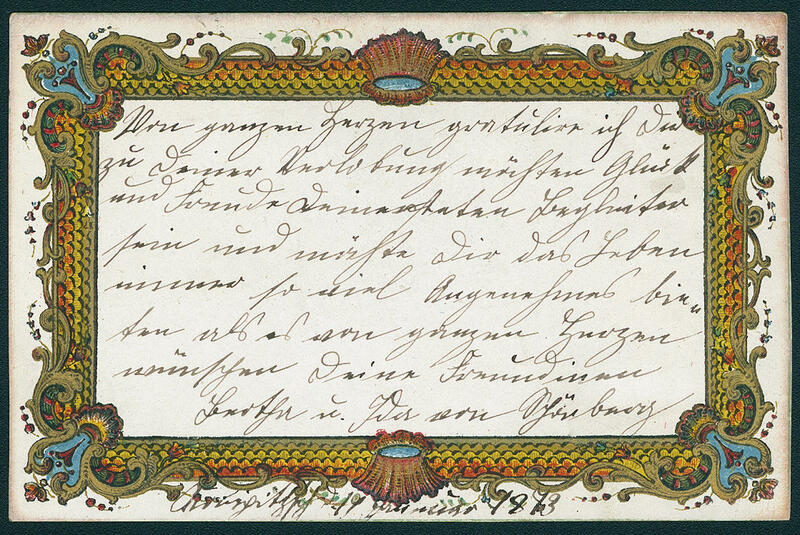 A fantastically beautiful letter of this rare colour! Photo expertize \"faultless condition\" Sommer BPP. 4567 ✉ 18 1 / 2 Gr. 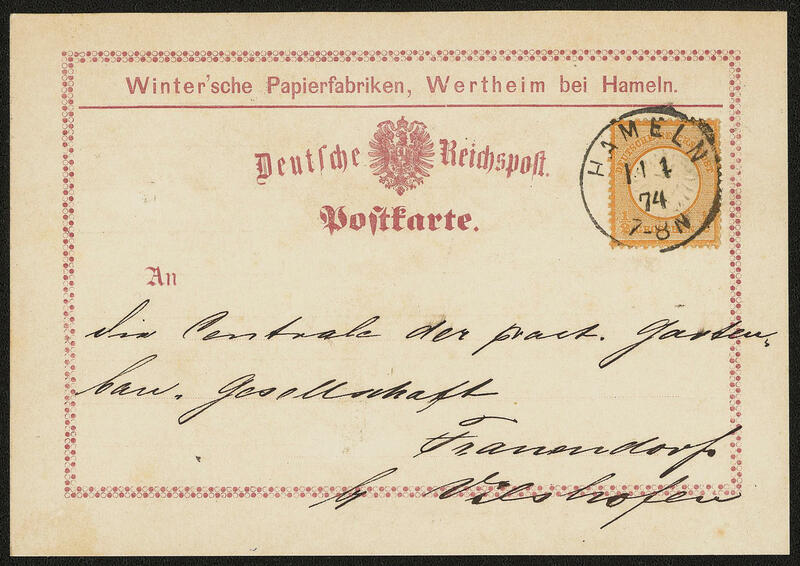 Orange, large shield, having bright colors outstanding quality on gorgeous, very rare ornamental postcard the \"WINTERSCHEN paper factories IN WERTHEIM by HAMELN\" with clear single circle postmark \"HAMELN 14.4.74. \" to Frauendorf. So nice decorative postcards the breast shield issues are extraordinarily rare! Provenance: collection Volny. Photo expertize Brugger BPP. 4568 ✉ 18,19 1 / 2 Gr. Orange, 1 Gr. Carmine in the horizontal pair, large shield, all three values illuminating fresh colors and well perforated in perfect condition on beautiful cover with three crystal clear small sausage cancel \"KIEL 10.3.74\" to Stockholm / Sweden. A dreamlike nice international franking for the highest standards! 4569 ✉ 18/19 1 / 2 Gr. Orange, 1 Gr. Carmine, large shield, two wonderful having bright colors items in outstanding quality on a wonderful cover with two crystal clear, all exact and straight mounted horseshoe cancel \"Hamburg 17. OCBR. 74. 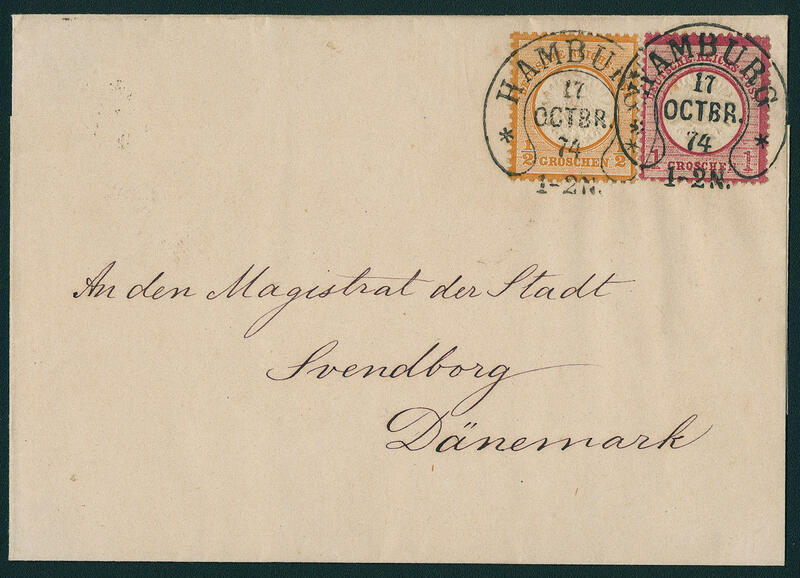 \" to the magistracy of the city Svendborg Denmark with arrival postmark. An utterly perfectly letter in outstanding quality for your highest requirements! 4570 ✉ 19 1 Gr. 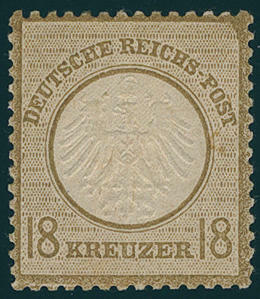 Carmine, large shield, having bright colors and perfect centered and perforated outstanding quality on very decorative ornament letter with on all sides complete got gold scroll printing with clear three line railway cancel (TPO) \"EISENACH-BERLIN\" to Hanover, a few tears in the cover are closed and foldings reinforced. Besides is the originals colored printed content available. So nice ornamental letters with breast shields frankings, besides still with content, to class among the large rarities of this issue. A phenomenal cover, the also according to photo expertize to the prettiest ornament letters of this issue counts. Photo expertize Sommer BPP. 4571 20P 2 Gr. 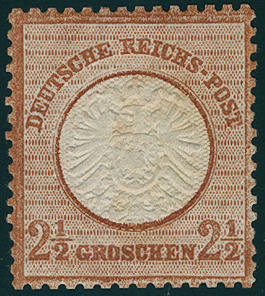 Red-brown, large shield, the extremely rare color proof to the preparation the manufacture the 2 ½ Gr. Stamp, wonderful fresh colors, at the bottom inconspicuous after perforation, unused with original gumming. 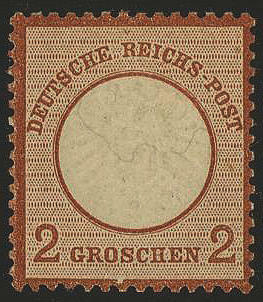 A very attractive copy this German Reich rarity, of the only a few copies became known are. By Michel clearly undervalued! Photo expertize Jäschke-Lantelme BPP. 4572 21a 2 ½ Gr. Reddish brown, large shield, wonderful having bright colors, excellent embossed and good perforated extremely fine copy with original gumming. An extraordinarily scarce, nearly always missing issue! Photo expertize \"perfect quality\" Krug BPP. 4573 ∆ 21a 2 ½ Gr. 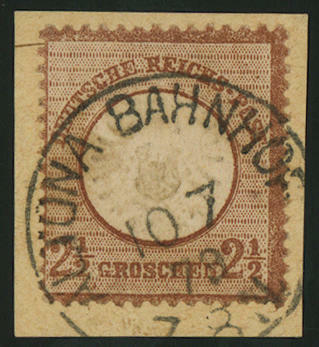 Red-brown, large shield, horizontal strip of four, wonderful fresh colors, well perforated and centered on beautiful letter piece with two clearly box cancel of 2 lines \"WALDHEIM 3. XII. 73. \", an especially nice copy this sought-after and rarely unit, superb in every respect (choice copy), photo expertize Hennies BPP. 4574 ✉ 21a 2 ½ Gr. 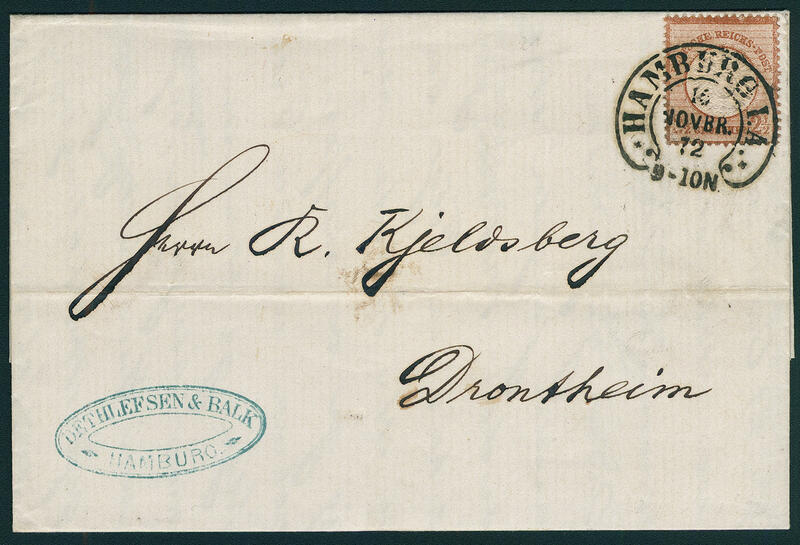 Reddish brown, fresh colors and well perforated on very nice cover with pricked clear horseshoe cancel \"Hamburg I. A. 16. NOVBR. 72. 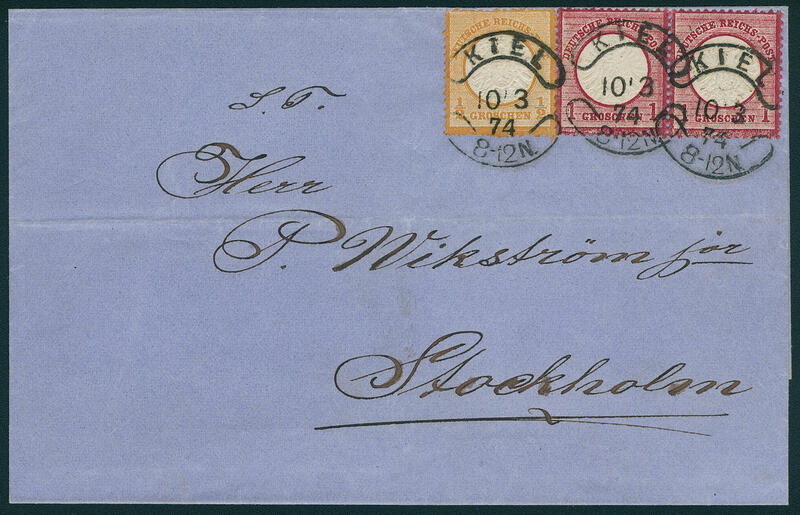 \" to Drontheim / Norway with full content and reverse single circle postmark \"CHRISTIANIA\". Outstanding quality! 4575 ∆ 21b 2 ½ Gr. 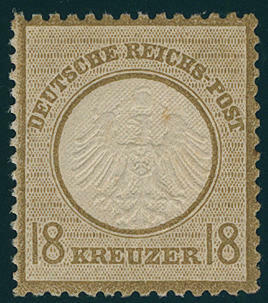 Lilac brown, large shield, wonderful fresh colors and excellent embossed, as well very well centered and perforated on piece with clear single circle postmark \"ALTONA railway station 10.7.73\", an outstanding quality of this rare colour, photo expertize Sommer BPP. 4576 ∆ 21b 2 ½ Gr. 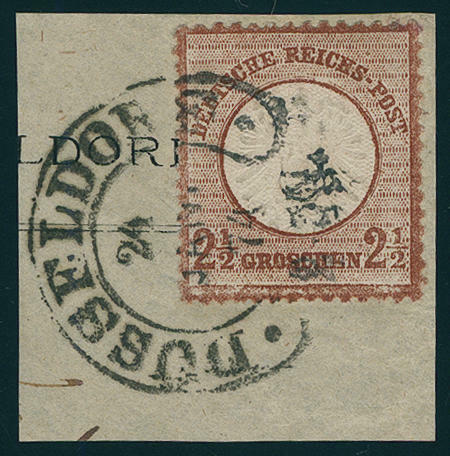 Lilac brown, the scarce colour, having bright colors outstanding quality on very nice letter piece with clear horseshoe cancel \"DÜSSELDORF 24. January 74\", stamp removed for quality control, photo expertize Hennies BPP. Michel 700,- €. 4577 ✉ 22,32,33a 5 Gr. 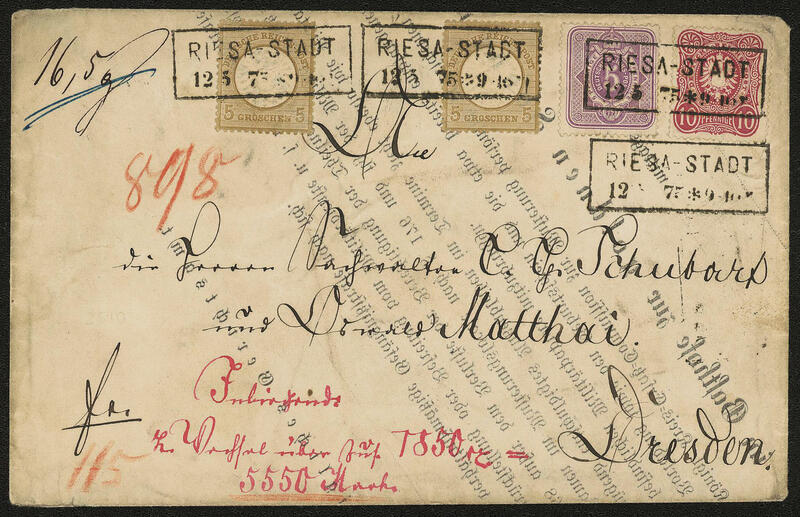 Ochre-brown, large shield, two values in mixed franking with 5 pennies violet and 10 pennies carmine rose, issue 1875, wonderful fresh colors and in perfect condition on very nice insured letter with clear rectangle cancel \"RIESA city 12.5.75. \" to Dresden. 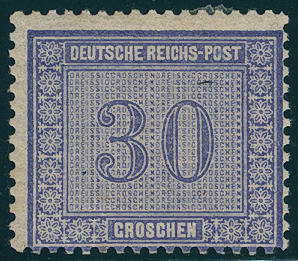 The cover was from a printed form of the royally court office folded. The indication of value of the letter amounted to be on 5550,- Mk. An in several aspects rare and all remarkable cover from gorgeous presentation! Photo expertize Sommer BPP.